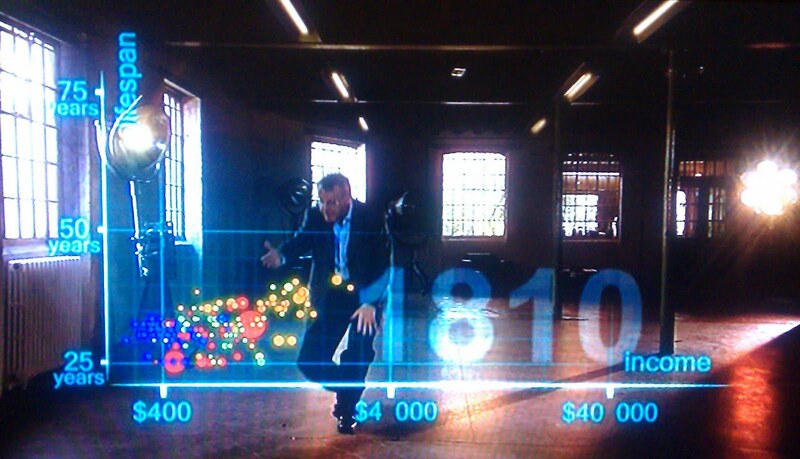 Hans Rosling was on BBC2 last night, presenting a program called 'The Joy of Stats'. He showed his amazing visualisation of a 200 year history of life expectancy vs. Income. If you haven't seen it yet, it's well worth watching. Unfortunately, the programme was a perfect case study in how to destroy a compelling dataset with chart junk. Take a look at the video above and how beautifully clean and simple that chart is. Now imagine a camera cutting all over the place and zooming in and out of an image that looks like this. I can't believe it was Rosling's idea. Pretty, maybe. But so much less effective.